Well a lot has happened over the past year, and I haven’t blogged much really since leaving the classroom to become and Instructional Coach and now a middle school assistant principal. One thing I’m passionate about though is leadership and professional growth. When I accepted the role as AP at Eisenhower Middle School this past summer I decided to write down lessons I was learning as I went. I’ve listed them below! Some are redundant, I’m guessing because well, some lessons take more than one experience to learn! Through all these lessons I’ve learned about leadership, I’ve also learned a lot about myself and about other people. Everything in a leadership position isn’t enjoyable, but consider others and use it as a chance for God to grow and develop you. One of the worst things a leader can do is try to have their hand in everything. Some decisions aren’t always popular and people will express that in their demeanor… Don’t take it personally! How you phrase things is critically important when delivering a thought. Do your best, knowing that you’ve done everything you can. In the midst of conflict, don’t shut down. Before you speak, consider: Will it hurt or help your testimony for Christ? Will it help or hinder your influence? Be mindful of what you say and who you say it to. Everyone is motivated differently. You gotta know people. Don’t make things a bigger deal than what they need to be. Just be real and be yourself. It’s okay to make mistakes as long as you learn from them! Keep work-related stuff to work hours, it’s better for your balance. When you’re calm, people around you are calm. And it’s just more pleasant that way! When emotions are high, wisdom is low. Don’t compare yourself to other leaders. God made us differently! And that’s fine! God made you to be YOU as a leader and them to be them! Don’t send emails on the weekends. Or texts. How you respond when you’re misunderstood, misrepresented, or mistreated is important. Speak with respect. Find common ground. Focus on Jesus. You can’t control people. You can’t always control situations. But you CAN control yourself. Don’t let what you can’t control work you up and get the best of you. Wisdom isn’t knowing everything, it’s embracing the things you can’t explain. When people talk and you ask for responses, listen and acknowledge and affirm. Choose words wisely in emails. Don’t aim for perfection. Aim for progress. Remember who you represent (Jesus). A good attitude goes a long way. There’s always more going on than what’s shown on the surface. Rules are there for a reason. Don’t jump to conclusions or assumptions. It’s okay to disagree but there’s a proper way to disagree. Not everything has to be addressed right away. Find the right time, the right tone, and the right attitude. When having tough conversations, don’t forget to listen. And remember that all behavior is communication. What is the person saying? And what is the person NOT saying? If you ask for feedback, honor the feedback. Don’t say yes right away. Honor and respect your authority. Leaders need to be humble. You need patience with those below you but you also need patience with those above you. It’s okay to not respond right away so you can respond properly. There’s always more to a story than what you think you know. Don’t change things last minute; consider all that will be affected. Stand for what you value. If you don’t decide what’s important in your life someone else will decide for you. Don’t let what should be mole hills becomes mountains. Trust that people will be professional. Don’t freak out right away, give things a chance, it’s not going to be perfect right away. Have confidence, patience, and remain CALM (with yourself). Don’t major in the minor. Go slow to go fast. Our job isn’t to convince the critics, our job is to do our job. Don’t just learn to live with criticism, learn to lead through it. There will always be critics. Don’t base decisions off of ONE person. If someone can do something 50% as well as you with momentum and upside, delegate it to them! Give away everything that someone else can do. The goal is to eventually do what only you need to do. Meet people where they’re at. If they’re asking questions that means they trust you. Inquire before you advocate. Don’t advocate right away! Don’t give away too much in your facial expression. Don’t laugh at unnecessary remarks, even if you think they’re funny. Stay true to the purpose of school. You don’t have to respond RIGHT away. When you ask a question. Pause for an answer. Don’t make a decision based on one person. Sometimes you just HAVE to make a decision. There are different TYPES of decisions. How you say it matters. Not everyone is passionate about what you’re passionate about. Not everything (or everyone) is perfect. The only person who will meet my expectations, is me. Lead from your feet not from your seat. •	Give 70 percent of your time to your areas of strength. •	Give 25 percent of your time to the areas you want to improve. •	Give 5 percent of your time to the areas of your weakness. Anxiety comes from trying to change what you don’t like, influence things you can’t change, or trying to explain something you don’t know. Don’t try to influence an outcome you can’t influence; (it gives you anxiety of what you can’t control!). You’re never more like Jesus than when you are humbly serving others. Both of these instances were in regards to OTHERS. Which convicted me. It made me think, as Christians, when was the last time we wept over… Liberal, KS? Or our country? Or our workplace? Our school? The students? Teachers? Coaches? Our unsaved loved ones? The list could go on and on. I think it’s safe to say that denying Christ comes in many forms. Any time we don’t choose Jesus in our words, through our actions, or even our thoughts… we’re denying Him. A lot of people don’t know this story (probably because it’s so embarrassing). But when I was younger, I believe in 8th grade, I wanted blonde hair. I thought only pretty people had blonde hair. All my friends who were blonde… were pretty! So naturally, I wanted that, too. But on top of naturally wanting that, to be like everyone else, I had a problem. I had (and still do by God’s grace!) natural red hair. I remember telling my mom I wanted to dye my hair blonde and for some crazy reason… she let me. Oh my. As I looked in the mirror with my dyed hair job gone wrong I was mortified. What was I thinking?! I’m a natural red head, and we all know natural red heads are some of the palest creatures on earth! So with my freak dye job (which did NOT make me pretty) and my pale skin I begged someone in my family to take me back to the drugstore to find a magical concotion that could take that awful bleach blondish orange color out of my hair. And thankfully I did. And sixteen years later, I run around with my natural, sometimes pretty (depending on the day), red hair. As a fourteen year old girl I was naive to the fact of what I already had. I was so fixated on wanting change that I was blind to something that frankly didn’t even need change. But as adults, those blinders sometimes come back on. Let me give you a different perspective. If I just had a different boss… I would be more content. If I just had a different job… I would be more content. If I lived in a bigger city… I would be more content. If I just had a better car or a nicer house… I would be more content. If I had blonde hair… I would be more content. I’m convinced that a lot of times we lack happiness where we’re at is because we’re fixated on something that God doesn’t intend for us right now, or maybe even never. We’re unhappy because we choose to be unhappy and there’s nothing wrong, it’s like we make it up in our own minds. So before you get caught in the trap of manipulating your way or taking a shortcut to somewhere you’re not even supposed to be yet… look around you and consider what you do have. My challenge to you: Be content where you’re at until the Holy Spirit moves you. God has you where you are for a reason. Maybe it’s to reach a lost soul that only you could reach. Or maybe it’s because He wants to grow you to be more like his Son. Don’t rush into things. Be content. I’m no longer a teacher in the classroom. As I’ve stated before, I’m now an Instructional Coach at Cottonwood Elementary here in Liberal, KS. So it’s been difficult to come up with ideas for my blogging. I’ve been trapped as to what to write about that can relate to Jesus and the work I do. Being in the classroom I felt like I was presented with a lot of opportunities and ideas that I could easily blog about and somehow relate back to Christ. My students taught me quite a bit. Jesus opened my eyes in numerous ways the past seven years. Being an instructional coach, my mission field has changed. Yes, I still have a passion for students, both educationally and spiritually. However, in this new position I work more with adults so it’s harder to find things to write about. I could go on and on and blame my lack of blogging on the fact that I’m in a new position working with a different “age group”. But God didn’t make me to make excuses. And God doesn’t want you to make excuses either! Maybe this week you found yourself justifying your sin. Or perhaps you were lazy in your Bible reading and prayer life, yet came up with “acceptable” excuses as to why it was okay. Or maybe you haven’t been to church in awhile because you’re mad at someone; or don’t feel comfortable, or you just enjoy that extra time to sleep in. Listen, God isn’t a fan of excuses, no matter the reasoning behind them. And we shouldn’t be okay with excuses either. We often make excuses because we’re lazy, disobedient, selfish, and prideful. This reminds me of how thankful I am that my Savior didn’t make excuses when He was hanging on the cross for my sin! I get it. It’s tough some times. We get caught up in the busyness of life. But when you become known for making excuses, that’s a problem. Every excuse you make, makes it easier to give another one. And don’t let your reputation be defined by your excuses. I’ve NEVER taught high school; I taught 7th grade. And now I’m an Instructional Coach at an ELEMENTARY school, working on my master’s degree to be a PRINCIPAL. I live in a super-nice apartment with one of my best friends. Definitely not what I had in mind. But you know what? I’m so happy and content. Content, yet willing to be uncomfortable with leaps of faith. Why is that? Well, because when I was 20 years old I got saved and since then I’ve wanted God to have His way in my life. Looking back on my twenties, numerous things have happened! Most importantly, I accepted Jesus Christ as my Savior! I had a BLAST in my twenties! God brought me through a lot; praise the Lord. He changed my life! I’m not who I was, thank goodness; and I’m excited for my thirties! I know God still has great things for me. We… Shall… See…! God’s plans for my twenties were way better than what I had in mind, so I can only imagine what He has in-store for me in my thirties! This place right here has had a significant part molding me into who I am today for the past 7 years. I remember the day I applied for this specific teaching job online and thought it was a fake website. Haha! I remember the phone interview (and how I wasn’t even going to answer it). Can’t forget the in-person interview where I was scared and intimidated leaving it and hoping they wouldn’t offer me the position. And finally, moving out to this town I’d never heard of where I knew absolutely no one. In this building, I’ve learned a lot about myself and what it means to be a better teacher, friend, colleague, role model, leader, follower, coach, and mentor. I’ve made some lifelong friendships working here; friendships that God knew I needed. It’s a place where my faith, patience, and humility have all been tested and tried. Sometimes the outcome had a sweet savor of success; other times, the stench of failure. But underneath that was the chance for growth and self-discipline and motivation. I was really looking forward to being in a brand spankin’ new building this upcoming year which I emphatically voted “yes” for a few years ago on the bond issue. However, after months of a combination of prayer, reading God’s Word, messages from the pulpit, and seeking godly counsel; this journey has come to a bittersweet twist. I’ll be an Instructional Coach at Cottonwood Elementary this next school year where I’ll get to take my experiences and knowledge gained from being at SMS and help other educators in their individual journeys. I’m nervous, excited, and scared all at the same time! I’m nervous because I’ll be at an elementary school. You might be thinking, “Why would she be nervous about that?” Well, because I have zero experience with elementary students and elementary teachers. I don’t even have observation hours from college in the elementary field! My degree is completely in secondary education. I’m excited because it’s a great chance to work with others and see different perspectives. For the past seven years, all I’ve known is middle school. I hope to become well-rounded professionally…. and hopefully not physically! If I were to choose one adjective to describe how I feel overall, it would be grateful. I’m grateful to God for this new opportunity to continue to grow in different areas of my life. And to continue to mature mentally, emotionally, and spiritually. Thinking about the emotions I’m feeling, I’ve realized they’re absolutely normal when it comes to change. Change is always nerve wrecking. Change is exciting. Change is scary. But I’m ready for this new challenge. 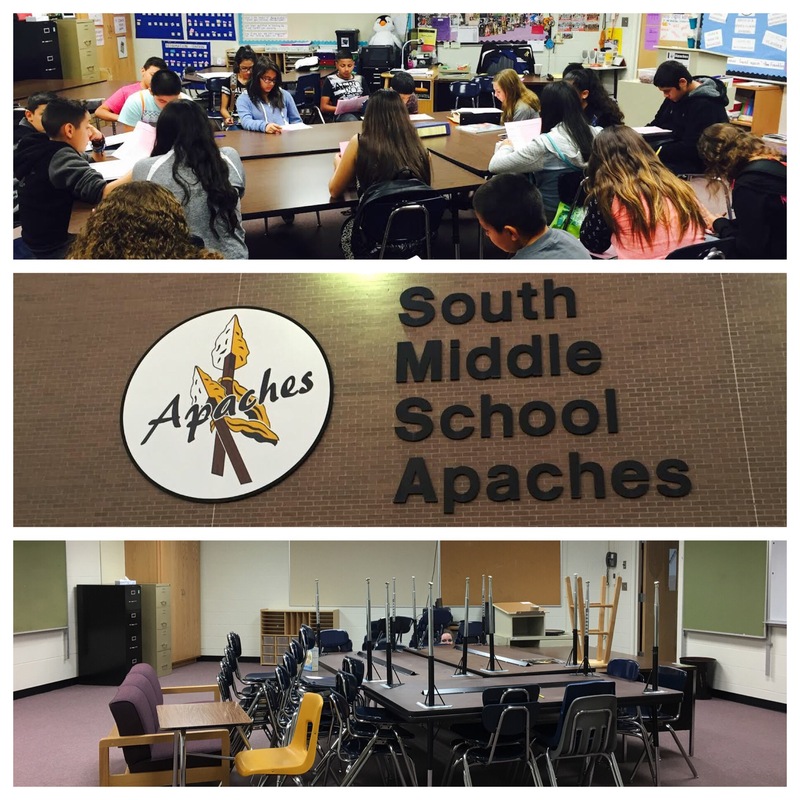 To all my coworkers and students I’ve ever worked with at SMS… THANK YOU for helping to shape me into who I am today. You all are amazing and I couldn’t have done it with out you. A lot of people have no clue what teachers go through. The emotional toll it takes. The heaviness that weighs you down. The sacrifices that are made. For example, I personally know two teachers, good friends of mine, who this past school year have had burdened hearts and taken in a student to foster them. This past Teacher Appreciation Week held a defining moment for me as a teacher. You know what I’m talking about… One of those moments you’ll just never forget. Unfortunately, it wasn’t a great moment. I was recently being interviewed about what it’s like to be a teacher and some of the struggles we face, and I remember saying something about kid’s coming to school with so many personal issues, and things that weigh them down, and how those things can weigh us down, too. That happened this week. 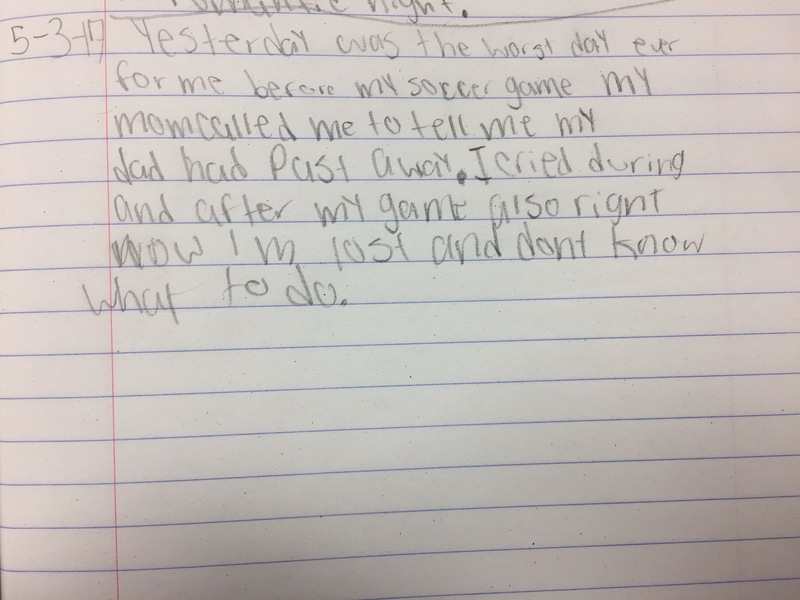 In one of my classes, it was a “Free Journal Day” so they got to write about whatever they wanted. I always ask for four volunteers to share, because it can be personal. It’s a small class. A young man volunteered to read his. A kid who’s been in trouble a lot of times. A young man who no doubt will probably be voted Class Clown for the entire 7th grade. The other students, and myself included, became silent when he was done, as he was clearly teary-eyed. He finally lifted his head and looked right at me where I was able to say, “We’re here for you.” And another student echoed it saying, “Yeah, (student name), we’re here for you!” As class went on, I ended up writing him a little note saying if he needed anything to let me know. So that was on Wednesday. Now, I have the pleasure of teaching this particular student for not only one class a day, but two. So, we see each other for 2 hours and 24 minutes every single day. Multiply that by about 175 days of school. That comes to 25, 200 minutes, or 420 hours. I’m thankful in that amount of time he was so brave to share something like that with myself and 8 other middle schoolers. Fast forward to Friday. I had him for his first class in the morning. He seemed okay. Then later again in that small class. Right at the beginning he came up to me, and I could tell he was upset. He asked if he could talk to me in the hallway, so I got things started with the other students and then we stepped outside. He started crying and telling me about how another student at lunch said she had lost her dad and he had given her a letter about how much she meant to him, and he told me that upset him because he’s never known that from his own father. He broke down and obviously wasn’t going to be able to focus. I gave him some options, and in the end he decided to take a piece of paper out in to the hallway and write a letter to his dad of all the things he would want to say to him. As he was doing that, it broke my heart. Because I too, know what it’s like to lose a dad… and a step-dad. While he was writing his little heart out I decided that I would write him a letter. His dad never told him how he felt but I figured maybe I could. He clearly needed some encouragement. I put it in an envelope and gave it to him when the bell rang. If you’ve read the four gospels, you know that they all go hand in hand with the account of Jesus. Sometimes, however, one gives a bit more information than the other. But what about John the Baptist? It’s no accident that in all four accounts, Matthew, Mark, Luke, and John… that John the Baptist is given an opportunity to be humble. He humbled himself. There he was, preaching in the wilderness, baptizing others, and sure, he could’ve taken credit. He could’ve made an even bigger name for himself than what he already had. Obviously people knew him. The Pharisees knew him. The king knew him. I mean, who hadn’t heard about this wild man wearing sackcloth and eating locusts and honey?! He had power. He had position. But he knew… oh my, did he know… his purpose. John the Baptist knew his calling and his purpose: to prepare the way for the one alone who could save souls: Jesus Christ. In each and every account from the gospels, as stated in the verses above, John the Baptist intentionally humbles himself and gives credit where credit is due. He doesn’t make himself greater than what he is. He magnifies the name of Jesus while minimizing his own. In every instance he talks about his unworthiness to even loosen a filthy, dirty sandle from the feet of The One, True King. He knows his power. He knows his position. But he ultimately knows his purpose. If you’re a saved child of God who gets discouraged and says, “I don’t know my purpose in life.” Sweet friend, let me remind you; we all have a purpose. If you’re walking in the will of the Lord Almighty, your purpose is just like John’s: to prepare the way. Now back to my original question: What about John the Baptist? Keep your focus. If God gives you an opportunity to be humble, take it. Don’t try to take credit that’s not yours. Don’t let your power or your position get in the way of your purpose: to prepare the way for Jesus Christ our Lord. This verse is referring to Mary, the mother of Jesus, during her pregnancy. Two questions I asked myself upon reading this verse were: 1. Why was her soul magnifying the Lord? And 2. Why was her spirit rejoicing in God her Savior? Those are two great questions to reflect on right after Easter. Two convicting questions for the day after Easter as well. Speaking of Easter, we had an amazing turnout at church for our service. About 715 people; for a small town of about 20,000, that’s awesome! I would say the two most popular occasions for people to attend church are Christmas and Easter. Time-out: Now to those of you who might get offended by this, and question peoples’ reasons for attending church, here’s some advice: Instead of criticizing our culture for not being “all in”, we should probably pray for them. The tongue is a wicked, wicked member. And one thing I’ve been learning when I see other people who aren’t “like me” is a good ole’ reminder from the Holy Spirit that I was once like that. Shame on us for comparing ourselves to others when we should be comparing ourselves to Jesus. Time-in. Going back to Mary, if we continue to read the next verses, we learn the answer to those two “why” questions. She was in awe that God would use someone like her… Just a teenager… Just a handmaiden. She knew how undeserving a girl like herself was and she was so humbled for God’s work in her life. (With a spirit like that, it’s no wonder God wanted to use her!). The verses go on and she continues to glorify God. But now, another “why” question. Why is that verse convicting the day after Easter? Well, it’s convicting to me because I don’t want to be someone who only magnifies the Lord on Easter Sunday. I want my soul to magnify the Lord on Monday… And the other 364 days in a year! I shouldn’t only be rejoicing in God my Savior on Easter Sunday or on Sundays in general, because God is still my Savior the other days of the week, too! So before giving “Chreasters” a hard time for only going to church twice a year, I think we should examine ourselves and how/if we magnify and rejoice in the Lord the other 363 days in a year. Today is a very special day. It’s my half birthday. Which means in exactly six months I’ll be the big 30. I’m actually looking forward to my thirties! I have some goals that I want to accomplish in that decade, like running a 5K, paying off my student loans, and continuing my education. But I have ten years to do all that (Lord willing), so instead of bore you with my future intentions for getting older, I’m going to bore you (possibly encourage or inspire you) with my goals for 2017 like the majority of other social media posts are currently doing. ﻿With this New Year of 2017 comes new goals and a newfound determination! I’m thankful the Lord has made me a goal-oriented person. This year instead of one goal for each category, I’ve decided to do two. If a goal is a SMART goal, it is… Specific, Measurable, Attainable, Realistic/Relevant, and Timely. 1. Focus on one scripture a month. I want to go even deeper in my walk with God, and ultimately get better at memorizing scripture and being able to recall it in moments of need. 2. Read my Spurgeon every day and night. I have a 365-day morning/evening devotional by Charles Spurgeon that a friend gave me and I’ve been meaning to delve into it. One thing I want to get better at in my spiritual walk is not just spending time with God in the morning, but in the evening and throughout the day also. Note: a devotional does not and will not ever replace my daily reading of God’s Holy Word. 1. Be healthy, happy, and strong. This is general and broad, but definitely measurable. And this is more toward being mentally and emotionally happier, healthier, and stronger than I was in 2016. 2. Read (at least) one book a month. This is geared more toward my mind and just gaining more intelligence, expanding my vocabulary (#nerd), and getting away from my my phone and Netflix. I’ve probably lost a lot of IQ points. 1. Get down to a certain weight. Normally I don’t set a weight goal, but last year I lost 32 pounds since February, just eating right and making smart choices, not even working out! And it’s only a twelve pound goal. This one is more of just a motivation to continue to clean up what I eat and add exercise as a hobby into my life. 2. Stop biting my nails. If I’m ever going to get married, I want these bad boys to look good for engagement photos! Hahaha. No, in reality, they’re just atrocious. That’s the real reason. Something I’ve always wanted to stop doing. 1. Go visit twice. I don’t see them enough, and I know they are disappointed about it, and frankly I am too. What if I’m the only one who will ever share the gospel with them? 2. Send a card/gift for each occasion. I’m terrible at this, even with friends. I just want them to know that I DO care and I DO remember. Just a nice little gesture. 1. Not use my credit card at all. Last year was my worst year for this. Thankfully I’m not in too much debt, but I definitely realized I don’t need to be spending money I don’t have. Duh. With that, I’m excited for 2017 and everything God has for me. He was faithful and the one true constant in my life last year, the years before, and the days and years ahead.